Me. Very little, but me. I was given up for adoption at birth. My birth mother was 19, and already had a 3 year old boy. She was a navy brat, living with her parents. Her mother, my birth grandmother, was sick with vaguely described “women’s issues.” She was not willing to take in a second grandchild (me), and was the one insisting on putting me up for adoption. My birth father was a gaping black hole. It is unclear if he was even aware my birth mother was pregnant when he disappeared, or he might have left when he found out. He was only described, cryptically, as “dark.” My mom thought maybe that meant Hispanic or Indian, given this was in Texas. The agency said they tried to match babies with families of a similar appearance and heritage. They said my birth mother was mostly Irish and British, just as my adoptive mother was. It didn’t turn out to be a good match in appearance. I was short, and dark of eye and hair, in a family of towering green and blue eyed Texans. How much of the pretty story was true? I’ve heard from other adoptees that “the story” was often made up. The potential adoptive parents were told what they would want to hear, to clinch the deal. So it could be entirely false, or totally true, or somewhere in between. Because I have a DNA test being processed at 23andMe. It sat here for a while, before I sent it in, as I pondered what the possible outcomes could be. This will sound idiotic, but when I ordered it, I wasn’t thinking at all about how I might find my birth family through it. I really got it to find out my heritage. It matters to me, where I come from, geographically. And I got it to look for answers to my multitude of health problems. The testing kit came, and suddenly I realised it could open a whole can of worms, or even two cans, and I didn’t know if I wanted to do that. See, as near as I can tell, no one is looking for me. I’ve been registered at online adoption registries since the birth of the internet. They’re easy to search, reach out, and make contact. It’s likely I have more than one half sibling out there, but they might not even know I exist. How will they feel if I show up on a DNA test? I have no idea how it would feel, growing up in a family, and then to find, as an adult, that you have an unexpected sibling. Would you feel betrayed? Let down? Angry? Both my daughters already have their results from 23andMe, and I’ve been poking around in them. They have different fathers, so, in looking at the “DNA relatives” they matched, if they both matched to the same person, it’s because that person is related to me. And, wow, are there matches. A lot. Some are as close as 2nd cousins to my girls. And more matches keep turning up. I have blood relatives, other than my girls. I doubt you can understand what that statement feels like, unless you’ve been where I am right now. It’s not something I can put into words. I stopped thinking I’d find my biological family quite a few years ago. What if they didn’t know of my existence? What if they don’t believe it (it happens, from what I hear)? What if they want nothing to do with me? What if they do? Will they be able to answer my questions, about the circumstances of my birth and adoption? Can they tell me my birth parents’ names? And in a soft whisper… Could I see pictures, of my biological mom and dad? Is that too much to ask? All the possible outcomes are terrifying. There are forums on 23andMe where folks like me talk about this exact situation. It often turns out badly, with rejection. There are a few good outcomes. I told my daughter, Rhiannon, the other night, as she calmed me down, after I freaked out when I found my girls have even more matches, this thing called adoption has been a huge weight I’ve carried around my whole life. In elementary school one year, we learned about genes and heredity, and were assigned a big genealogy project, to research and chart our family tree on posterboard, with the most pictures and details possible. I’m an Aspie – person with Asperger’s syndrome – although we didn’t know that then. I did the only thing that seemed right. I raised my hand and asked what I was supposed to do. I explained I was adopted, and I didn’t know my family tree. My teacher was momentarily befuddled. She told me to use my adoptive family. “But that’s not right. It’s not my genetics,” I argued. You have to understand. Aspies have an “unusually strong” attachment to the truth and what we perceive is right, true, and honorable. Making a family tree, to be displayed, using my adoptive family, was a charade, a huge lie, so much that it was anathema. I had to do it anyway. I remember a lot of tears. Of feeling like I was cheating, feeling guilty. Holding my hand up and asking that question had repercussions throughout my schooling years. Someone figured out that only bastards are given up for adoption. They never let me forget it. Even in high school, I remember the taunting. So, here I am, in my mid 50’s, and for my whole life I’ve known nothing of my biological family. I haven’t known where I come from, or who I am. It is such an odd, disconcerting, yet exciting, feeling, to know, in a week or so, that’s all going to change, when my results come in. Some adoptees don’t care about their birth family. I don’t know how much of that is because they “fit” into their adoptive family really well, like my (also adopted) brother did, tall and light eyed as our parents. Maybe it’s just personality. No one has ever loved me as much as my mom did, who did everything she possibly could for me, up until the end. We didn’t become close, though, until I was an adult. I wasn’t lacking in love, growing up, but I just never felt that I belonged. Like a lot of adoptees, there’s been this aching hole that’s been waiting to be filled. That’s as much about the countries my ancestors come from as anything. Seeing my daughter’s list of cousins that had to have come from my side, that was a holy cow moment. I have family. Biological family. And there they are, a long list, with initials and a few names. It is both the lifting of the weight, of being without blood kin except for my daughters, and a new and great weight, not knowing how all these people will react. Unless you are adopted, you cannot know how that feels, and I am failing at expressing it. Figuring out who is who based on DNA tests can be very challenging, unless a very close relative (parent, sibling) has tested with the same company. Even then, they have to have opted in to finding DNA relatives. I can send messages, and hope to hear back. And, hopefully, one day, fulfilling. I was doing it wrong, and I knew it. It was one year ago today, my mom had just died, but I wasn’t crying. “Something’s wrong with me,” I confided, oh so quietly, to those closest to me, a week later. They assured me there was no right way, no wrong way, to grieve. That it would come, when it was time, when I was ready. Apparently, that time arrived at 9 PM last night. I was thinking about what state of mind I was in a year ago, waiting for The Call to tell me she had passed away. The dam burst, and finally, the river of tears flowed. I wasn’t just missing her any more – I was mourning. All day today, I’ve gone through it all again, remembering the sad details of the time between her stroke and her death, writing them out. If I don’t remember them, and acknowledge them, how can I let them go? I was in a very precarious state, physically, by the time my mom died, two months after a hemorrhagic stroke. Those months were a nightmare, watching my strong, capable, and independent mom being broken into a mere shell of herself. I suspect the mourning got put on hold, subconsciously, so I could recover from the toll the physical, emotional, and mental stress had taken on my own fragile body. Those of us with ME, CFS, fibromyalgia, etc, have to carefully and frugally measure out our energy use, our spoons. (See Always Counting Spoons if you aren’t familiar with this concept). But there was little I wouldn’t do for my mom. She had always been there for me, through my many mistakes in life, always ready to pick me up and help me out. We were best friends who spoke most every day, and had no secrets. She was also a real rarity, because she believed in me despite my illness, and supported me both emotionally and financially. You might think any mother would support a sick daughter, but that’s very sadly untrue when the illness is ME (myalgic encephalomylitis), CFS (chronic fatigue syndrome), fibromyalgia, chronic Lyme. They are not understood even by many doctors other than a few specialists, and family, well, most family members don’t take the time to try to understand. I have a lot of friends ill with the same things, and very few have the support of their families, or only part of the family. I was so very lucky, to have my mom until she was 89. She was still telling me about any article or show she saw where my illnesses were mentioned, still reading articles about it that I posted on Facebook, trying to understand better. She still listened to me moan and groan and complain when I needed to. I had her, and I have my youngest daughter, who has a milder version of these damn diseases. She’s my caregiver, my best friend, my defender, intelligent and brave, and with a bit of her grandmother’s iron spine. You don’t want to piss her off anymore than you did my mom – her grandmother taught her well. I have my son-in-law here, too, who very bravely accepted the weight of being part of our family. It’s not an easy thing, being a caregiver to someone like me, mostly bedbound. But such is the power of Love. I couldn’t get through this life without them, and I don’t know how my friends who have no family support do it. I’ve been blessed, that’s for sure, and I’m so very thankful for my mom’s steadfast love and support. I will always love her, and I know she’s watching over me, loving me still. In some ways, I was relieved when my mom finally passed away. Seeing her the way she was, two months after a hemorrhagic stroke, ripped my heart out every day. She’d had the stroke in early September, and the months since had been filled with far too few ups, far too many downs, and devastating punches to the gut. She was only affected physically a little, and that mostly passed. But her mind… That bore the brunt of the bleeding in her brain. That is what haunts me. Dementia was just a word, without real meaning, until I watched, from a distance, as she slid further and further away. I wanted to go to her, in Houston, but I’m homebound with my own illnesses, and there was no way I could travel. There were endless phone calls, trying to talk to her, and talking to her doctors, nurses, and my brother and sister-in-law, who were there. Hours spent researching, trying to understand the possibilities for recovery. More hours went into hacking into her patient record at the hospital, pouring over the flood of lab and test results, learning a whole new area of medical terminology, translating that for family, and relaying it all to my eldest, who was deployed to the middle east. I’d already spent 4 years being my mom’s patient advocate from a distance, intervening with doctors, calling, faxing, emailing, tracking her labs, researching her meds and demanding changes from doctors who were too busy to spend the time I was. She was 89 years old. Every problem was written off as “just getting older.” How angry that still makes me. If they’d paid more attention, they’d worked harder to control her blood pressure, and sent her to the ER when her BP was incredibly high and she had a headache, the outcome could have been different. After the stroke, my brother would bring the iPad to the hospital, so we could do video chats. They were difficult from the start, seeing my mom’s confusion, anxiety, distress, and fear. She didn’t understand that she’d had a stroke, where she was, or what was happening. Sometimes she knew me, sometimes she didn’t. The nurses said she was often combative, angry and afraid, cussing them out while they tried to help. As the days turned to weeks, getting her to eat, drink, and take her meds, became nearly impossible. She went from hospital to nursing facility and back numerous times, with new issues cropping up, one after the other. She often would wander around, and had many falls. The last video chat we had haunts me. My brother propped the iPad up on the table, so I felt like I was there, but I don’t think she even looked at me. Her face was gaunt, and her always beautiful skin was marred by large deep purple and green bruises, with more on her arms and legs, from her falls. Her eyes stared blankly, empty except for anger when my brother tried to get her to eat her meds-laced ice cream. She wasn’t there. The spark of Love and Life that animated my mother, spilled from her over me for my whole life, was gone. I knew she would be appalled at her condition, and would never have wanted to go through all this. I cried that day, to see her so diminished, bruised and battered, who had always been so strong and imposing. Making the decision to put her in the gentle hands of hospice care that day was easy. The doctors now said she had terminal dementia. Hospice would see that she was comfortable, allowed to slip away naturally. 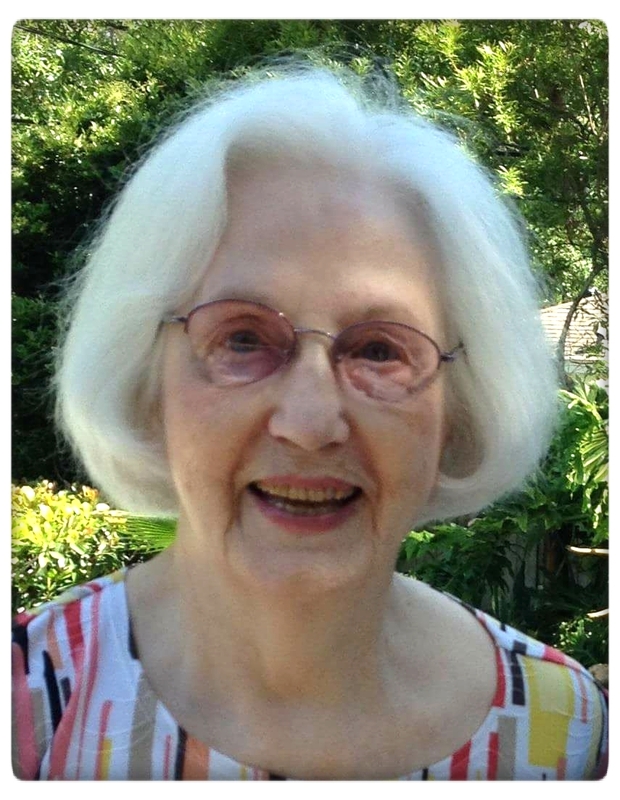 The day after hospice took over, she went to sleep, and became unresponsive. My brother showed me her nice room on chat, with all her furniture, as she laid still, on the bed. No more IV’s, no more prodding her to eat, no more distress. Resting gently, she slipped deeper and deeper into a coma. I thought she would pass away quickly after that, but she was stubborn to the end. Every night I went to sleep, so lightly, in case The Call came in. A kind-hearted hospice nurse told me it could “be a while,” and he had one patient who went 33 days in a coma, in what is basically a hibernation state. I had no idea someone could linger that long without water or an IV. The waiting was hard, and very busy, helping to arrange a funeral in her tiny home town of Loop, TX, and keeping folks aware of developments. My ill body was not taking all this well, and I was having some major physical issues. Too little sleep, too much laying in bed wondering how she was in the middle of the night, too little eating… I tried desperately to stabilize my own system. My mom lasted 6 days. The Call I’d been expecting came moments after I woke up on my own, alarmed. We’d both always known when the other was going to call, and this final call was no exception. Gazing over the mountains my mom had loved so much, I watched the dawn light creep into the day, as I had just enough time to say a final goodbye. I felt her then, and I’ve felt her presence many times since then. And I always will. She was truly my guardian angel in life, and nothing’s going to stop her from continuing to look out for me. This story starts with a dog, and ends with another. It’s long, and touches on sensitive subjects, with raw, open, honesty. The last 10 months have been quite a journey, full of sorrow, shock, a moment of extreme clarity, a lot of contemplation, reflection, unexpected dreams, and then resolution, when the dream became reality. It started with watching the slow decline of our elderly dog, Kasha, who had a number of health issues. The most difficult was degenerative disc disease, and as last summer turned to fall, she was having increasing difficulties controlling her rear legs. Then came a shocking phone call, when I found out my spinal x-rays didn’t show the herniated disc I expected, but instead showed that I, too, have, “severe multilevel degenerative disc disease,” on top of everything else. I was caught way off guard. I had been working on the premise that I am going to get the ME/CFS under control, using all my supplements, and that one day, once I figure out these migraines or get thru perimenopause, I was going to be back to some semblance of myself – I know there’s damage that will always be there, but I think there’s a lot that can be fixed, too, slowly, over time. But, it’s basically going to be with me the rest of my life. There are a few things I can do, some supplements and maybe some physical therapy, and I’ve gotten a TENS unit that helps. But my spine is very unstable – I’ve been going through periods for two years, where I “throw my back out,” and I can feel the discs moving out of place, and pain and sciatica flares like a bonfire. After absorbing this news, I walked out into the living room to find that Kasha had lost control of her bowels, and there was a trail of poop leading through the living room and onto the porch. She was lying there looking so very ashamed. Kasha was at her “red line,” the place where dogs with degenerative disc disease are no longer recoverable – it was not going to go away with rest and time, and was going to be the end of her, and soon. And just as clearly, I felt that I, too, now have a red line, though I’m not to it yet. My mind played it out for me… me with a walker, or in a wheelchair, although I don’t know how I could even use either because of a torn up shoulder, and the weakness and utter exhaustion of ME, CFS, fibromyalgia, etc. There was the feeling of a door slamming shut in my mind, those images simply shut out. I won’t, I simply can’t, live in a condition where I’m bed bound and need a wheelchair just to get around. And I won’t be that kind of burden on Rhiannon and Ben, either. And, much to my dismay, I felt relieved. Relieved, because the long fight would be over. I didn’t realise how very tired of the constant struggle I was. I didn’t so much as make a decision as have one thrust on me from deep in my soul. Just as Kasha would find her peaceful end, in a beautiful, sacred, manner, when the pain became too much and when she couldn’t rise, I too, would find that place. I have many friends, fellow patients, who have to use wheelchairs or walkers or scooters, and I have the utmost respect for them. But that’s simply not something I can accept. I have been sick for more than 17 years, and almost entirely housebound for 10 years. I cannot accept any further limitations on my ability to move around. I am meant to roam mountains and walk through my beloved woods. I am meant to be a wild thing, and I can barely take the captivity I have already been in for much longer. I am the wolf, tightly caged, pacing back and forth, going slowly crazy from my longing to be free. But here was this realization that I wasn’t ever going to go running barefoot again, through the golden autumn woods calling to my Heart that day, because my spine is simply too unstable. That’s a huge and terrible loss, and the shattering of all the dreams and plans I’ve been holding on to… I wanted to get well enough to be able to help some of my dearest friends, my soul sisters with ME, CFS, fibromyalgia, etc, maybe share a house with them, all of us working to heal each other. In the months since that moment of clarity, and through Kasha’s gentle passing, the sacredness of her death, a gentle release with mercy, I’ve spent many sleepless nights, thinking about just what I wanted to do, and how much fight was left in me for this new, seemingly insurmountable, challenge to my health and my life. There are things I want to do, and things I need to do. And then along came some dreams, and some info about dogs, that had me reevaluating how long I am willing to fight to go on. Twenty years ago, living in fear from a relationship gone terribly bad, I lay awake in bed at night, too stressed and worried to sleep. I found solace in meditation and visualization (shamanic journeying). Usually, I would “go” to a beautiful forest at night, and run as a wolf until I finally curled up, safe, in my den. I’d fade off to sleep that way. But one night, instead of being in my forest, I found myself high on a rocky outcropping, in a sea of rippling sand. I could see in every direction around me, see that I was safe. I laid down in the sand, pulled my cloak around me, and felt desert winds deposit a soft blanket of sand on me. For years, every night, I went to the desert to sleep. I studied the desert as it is today, and as it was. I drove my family crazy with my sudden obsession with the desert. I didn’t explain that the desert had come to me, unexpectedly, but it was saving my sanity. The decades passed, and I eventually went back to my forest – until my moment of clarity. Ever since then, every night, I retreat to incredible vistas of desert dunes, open caves and hidden chambers. This time, though, there is something else there with me: a lean desert dog, colored the same as the sand, and with electric eyes that look right through me. I know the feel of her soft ears, and my fingers remember the shape of her head under my hand. Salukis, a beautiful desert Sighthound, have fascinated me since the desert came to me. They are perhaps the oldest of all dog breeds, and the only type of dog who was not seen as “unclean.” Desert nomads have cherished the Saluki for thousands of years. I’ve wanted to have a Saluki or Saluki mix for 20 years. But now, through chance, I learned that most people in the middle east treat dogs in horrible, horrifying, ways. They do not value them as we do. Many Salukis and other dogs are simply dumped in the desert when the owner tires of them, or if a racing Saluki doesn’t run fast enough. Some racing Salukis have their ears cropped off “to make them run faster.” The Salukis have bred with the many other dumped dogs, and now “desert dogs” are pretty much a breed of their own – small Sighthounds, usually with short fur and tails that spiral into a curl. The pictures are terrible to see. Dogs so emaciated you can’t believe they are alive, or who’ve been viciously beaten, or thrown out of a moving car, leaving them with broken legs. Dogs who have been shot by the police, in front of children, when an area has too many strays. Dogs beaten with stones by children, who know no better. Need I go on? Adopting a dog from the middle east can be somewhat complicated, but there are many groups and individuals there, mostly westerners, who are involved in rescuing the ones they can, fostering them a time, then finding them new homes in the U.S. and Europe. Some send the dogs to the U.S. first, and then put them up for adoption, and others work directly with those wishing to adopt. And then, there she was. 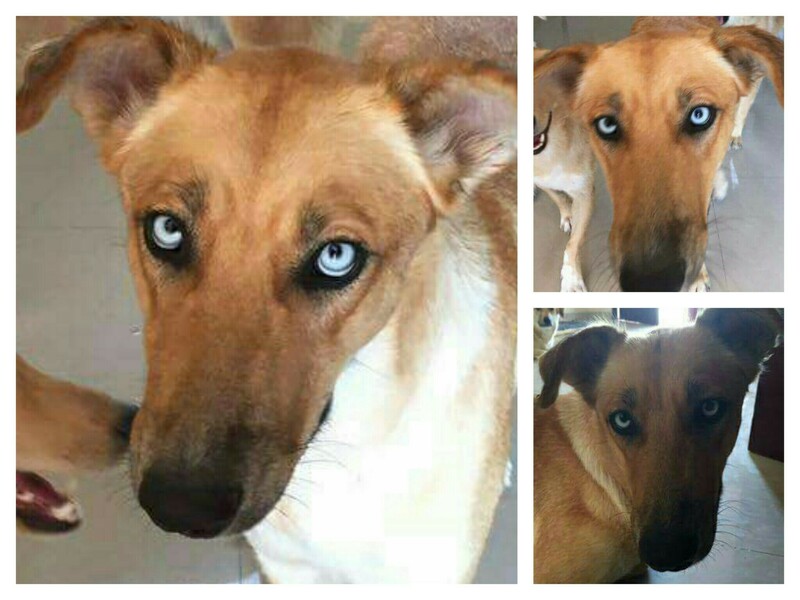 A desert dog with electric, topaz blue eyes, just as I’d been dreaming of. I really didn’t think she could exist. But she does. 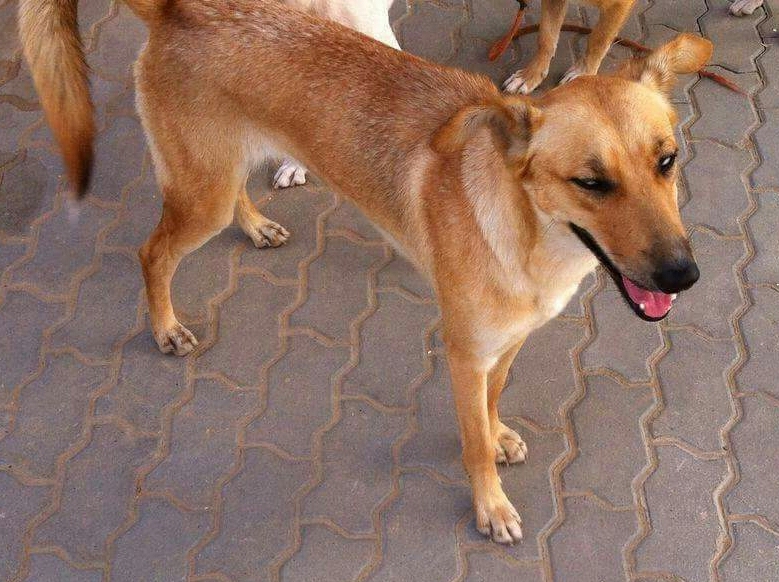 Ellie is about one year old, and was found dumped to starve or fend for herself. Despite that, I hear she’s an incredibly loving and gentle dog. She’s not too big, and not too small, either, weighing in at 40 pounds. After weeks of working on arrangements, my Ellie will be flying from Dubai, in the UAE, home to me on Monday, June 27. What a birthday present! For me, Ellie is Hope – hope that I will have improvements in my health, and she is incentive to keep on fighting, keep on going, no matter how hard it sometimes is. By fulfilling my dream of having a desert dog, my motivation and inspiration to keep moving forward to experience her whole life with her is immensely boosted. That’s just how much I love dogs. I’ve also become close friends with Ellie’s amazing rescuer, Charlotte, and with Marci, who is practically a one woman whirlwind of dog rescuing in Al Ain, UAE. I am completely in awe of what they are doing, and will be forever grateful for all the hours of work, time and money, that went into getting Ellie cleared to fly and come home to me. I’ve set up a fledgling Facebook page for them, in the hope of helping other dogs find homes. It gives me inspiration, to know that I can still do something with my life, even if all that it takes is monitoring a Facebook page. I’m not completely useless, after all. I believe everything happens for a reason. It was not coincidence that I learned about the desperate conditions for dogs in the middle east, and it was not coincidence that Ellie showed up in need of a home, the dog from my dreams, one I didn’t think could possibly exist. Ellie of the Topaz Eyes is the fulfillment of a 20 year long dream. If she can happen, what else might be waiting around the corner? All I know is that I have Hope again. I'm Ash, and this is Wolfdreams. I mostly seem to be writing about living with ME/CFS, FMS, Lyme, and other chronic illnesses, lately, but I far prefer to ramble on (and on) about Life, dogs, nature, and spirituality. I'll try to get back to more of that! Want to connect on Facebook? You can find me as Wolfdreams. Send me an email to ashwolfdreamer (at) gmail (dot) com. I am not a doctor, nor do I have any medical training. Nothing in this blog should be construed as medical advice. I am a long-time patient sharing my personal experiences and opinions with ME/CFS/FMS/Lyme. Always make your medical decisions in consultation with your own physician (and I hope you found a good one). Copyright © K Collins and Wolfdreams, 2009-2018. Unauthorized use and/or duplication of this material without express and written permission from this blog’s author and/or owner is strictly prohibited. Excerpts and links may be used, provided that full and clear credit is given to Ash and Wolfdreams with appropriate and specific direction to the original content.